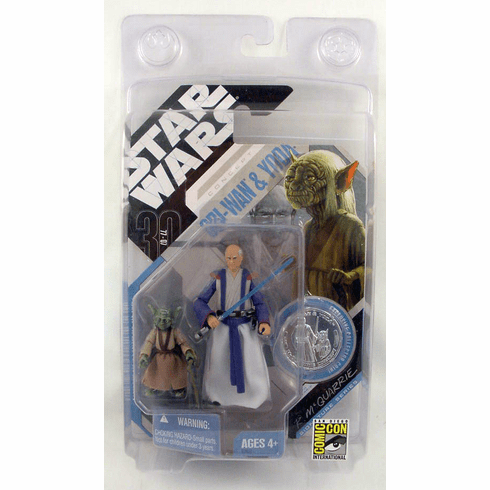 Star Wars McQuarrie Signature Series Concept Obi-Wan & Yoda was a San Diego Comic Con Exclusive. The vivid imagination of conceptual artist Ralph McQuarrie brought to life the characters and worlds envisioned by George Lucas. McQuarrie's paintings and drawings were instrumental in the push to bring Lucas's saga to the big screen, giving shape and form to a multitude of fantastic individuals, creatures, planets and technology encompassed in this epic tale. Developed in collaboration with McQuarrie himself, this remarkable action figure series pays tribute to the man whose art defined some of the most memorable characters in film history. In his sketches, concept artist Ralph McQuarrie evokes the graceful power of a ninja master or samurai warrior in his drawing of Obi-Wan. The diminutive Yoda appears leaner and more whimsical than he will ultimately appear in the films, yet he still exudes mystical strength.